Aphorisms abound on the subject of how to know if you’ve found The One For You. In the more than 20-year relationship between Traci and John Proctor, the latter phrase has been their motto and mantra. From something akin to first-sight-love to careers that have taken right turns, soared, fluttered and now steadied into a sure and steady flight-path, the couple has settled into Tallahassee. Since 2017, Traci Proctor has been executive director of Tallahassee’s Ronald McDonald House. She exudes organizational competence and a no-nonsense charm. “I guess you would say that I am determined, stubborn and responsible,” she said with a smile. Yet, when in proximity to her husband, Traci Proctor’s demeanor softens to that of a teenager in the early days of love. Traci is comfortable in dark business suits as she guides programs at Ronald McDonald House, a nonprofit organization that provides a place to stay, for free or at a reduced price, for families of children undergoing medical treatment. John is more at home in rubber flip-flops, sports shorts and stretched Tee — the clothing of choice for the head coach of Florida State University’s diving program. They keep their focus on each other and what they do, preferably without fanfare, so they took time to ponder whether a magazine article about their relationship would be right for them. Their story John acknowledges that as a youth in Louisville, Kentucky, a heady career path didn’t seem likely. Here, Traci stretches her hand into his and gazes at him. During those formative high school years, it would seem that Traci and John had nothing in common. “My family, unfortunately, was falling apart,” Traci said. Her father and a step-father had left, her mother was in the hospital, the family assets were in receivership, and 16-year-old Traci had become the caretaker of her two siblings and the breadwinner of the family. “Remarkably, I got a job in the mayor’s office of our town,” she said. Town leaders in Valparaiso, Indiana, took note of the bright teenager who without complaint was taking up any slack in her disintegrating family. Meanwhile, John had finally found something that piqued his interest. And he was immediately good. “I won two state high school diving championships on springboard,” he said. He even began to harbor thoughts of diving as a career. It wasn’t long before John too received a scholarship to Auburn University. At Arizona, Traci modulated from dreams of engineering to business, and she was thriving. By his sophomore year, John, too, was doing well. He was diving, helping diving coach Rick Theobald at Auburn and coaching an age-group team. That is, until the accident. “It was on the skate board,” he said. So, he decided, was his college career. He dropped out of school except for a random class, cooked in a restaurant and wondered what to do next. Then he received an “out of the blue” invitation to become coach of a diving team in Tucson, Arizona, and to manage the University of Arizona’s diving team, a position in which he started in 1997. And the stage was set for the serendipitous meeting that would change Traci and John’s life forever. “I picked him up in an Irish pub,” she said with a laugh. New in town, without a car to pick her up for the next evening’s dinner, John coaxed a car from a buddy and, though two hours late, got his date. The two somehow found their new connection irresistible. They were married a year later — just about the time John got a call to go to Midland, Texas, to run a huge not-for-profit diving program. John built the program into one that became nationally known, and over 15 years he produced dozens of Junior National individual champions. “The kids loved him,” Traci said. And very soon, they made a “kid” of their own. Daughter Leigh, now 16, was born. Traci’s career blossomed as well, first at Midland College, then later as head of the City of Midland Aquatics Program, where John coached. He said she developed programs for adults, for physical therapy and for rehabilitation and worked to raise $25 million for an 80,000-square-foot building that she helped design. At Midland, John’s diving program was producing young athletes who were beating college contenders in international competitions. He saw his divers recruited to top-flight universities, and he eventually followed their path. The call from Florida State came in 2013, and the Proctors moved to Tallahassee for the 2014–15 season. For Traci, who’d established deep roots in Texas, the move was bittersweet. She would continue making trips to Midland for several years. 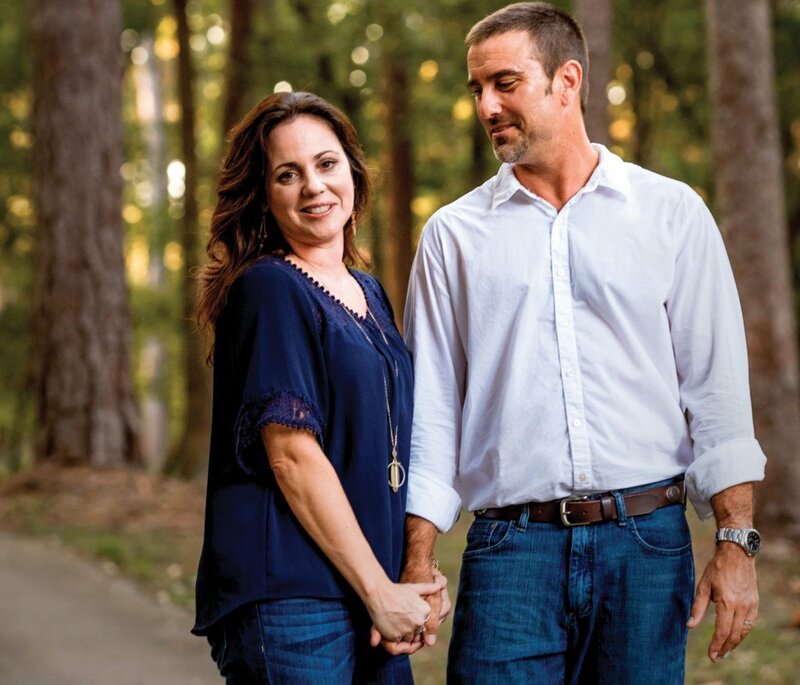 After a final moment of indecision about where her heart lay, the couple renewed their commitment to Tallahassee and what they do — John developing world-class competitors and Traci helping families cope through stressful and uncertain times. “As a couple, we decided that our happiness is in doing what we love together … no matter where that is,” Traci said. Meanwhile, the interview was ending. John was needed back at the pool. He was busy recruiting and setting up his roster for the coming season: “Two ACC champions, some All-Americans, and one from the Junior Pan Am Team …” he said. And what about his own diving urges? John laughed. “On our vacation in Mexico this year, I jumped off a rock.” That’s good enough, the couple said. Seeing each other clearly, John and Traci Proctor are concentrating on their own springboard — into the future and in a place they love.